Mother’s Day came early for me, compliments of Snip-Its South Bay in El Segundo! Yesterday, my daughter and I experienced the popular kid salon’s Mommy and Me Spa Package, which included a signature facial, pedicure, and manicure in their private party room. What’s cool about this spa package is it’s offered YEAR ROUND and not only for Mother’s Day! I rarely pamper myself, so it was quite a treat to receive this spa package from Snip-Its salon in El Segundo. My daughter’s had her nails painted at events (and loves it), so doing the full mani/pedi was going to be fun and an interesting experience. I do love going to the spa, which nowadays only happens on special occasions. 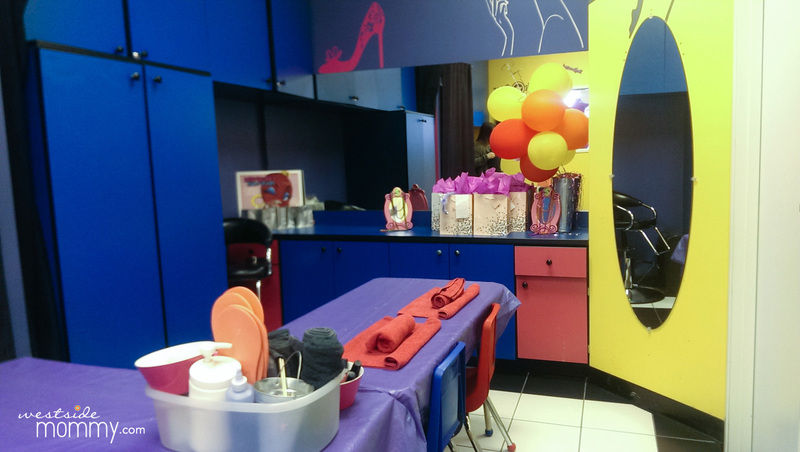 The Mommy and Me Spa Package took place in Snip-Its Salon’s private party room. My daughter and I were offered terrycloth robes (she did not want to wear hers) and sat on beanbag chairs. We soaked our feet in water, which they threw bath bombs in, that fizzed (my daughter’s favorite part) to make our feet smell good and skin soft. While our feet soaked, they applied a face mask and put cucumbers on our eyes. My kid only wanted one cucumber, because she wanted to be a pirate, I suppose. After relaxing for a few minutes, our mask was removed and moisturizer was applied. Then, the salon expert used a scrub (which my daughter found ticklish) on our feet and calves then massaged with lotion. The biggest decision is always choosing a color! As adventurous as I want to be, I’m pretty boring in this department and opted for pink fingernails and orange shimmer and glittery toes. My kid chose glitter toes and green fingernails. There wasn’t any pushing of cuticles with this mani/pedi, but she did file and shape, which was perfectly fine. We got another bath bomb in our manicure soak, which made my kid happy. What made her even happier was the TV they had in the room, which I said was ok for her to watch at this point. While she watched Sofia the First, we got our nails done. Thank you, Snip-Its South Bay for a wonderful experience! We enjoyed it a lot and I see it as the gateway to my daughter’s future spa obsession! Snip-Its is the expert in Kids haircuts! No appointment necessary. Walk-ins are welcome. Disclaimer: Snip-Its invited us to experience this in exchange for a review on this site. No monetary compensation was made for this post. All opinions, as always, are 100% my own!